Definition at line 107 of file llviewerpartsource.h. Definition at line 83 of file llviewerpartsource.cpp. References LLViewerImageList::getImage(), LLControlGroup::getString(), gImageList, gViewerArt, llassert, LLViewerPartSource::mImagep, LLViewerPartSource::mPosAgent, LLViewerPartSource::mSourceObjectp, LLMemType::MTYPE_PARTICLES, and TRUE. Definition at line 121 of file llviewerpartsource.h. Definition at line 98 of file llviewerpartsource.cpp. References LLViewerPartSource::mIsDead, LLViewerPartSource::mSourceObjectp, mTargetObjectp, LLMemType::MTYPE_PARTICLES, NULL, and TRUE. Definition at line 408 of file llviewerpartsource.cpp. Definition at line 414 of file llviewerpartsource.cpp. Definition at line 376 of file llviewerpartsource.cpp. References LLViewerObjectList::findObject(), gObjectList, LLViewerPartSourceScript(), LLMemType::MTYPE_PARTICLES, LLPointer< Type >::notNull(), and NULL. Definition at line 334 of file llviewerpartsource.cpp. References LLViewerObjectList::findObject(), gObjectList, LLPartSysData::isNullPS(), LLViewerPartSourceScript(), LLMemType::MTYPE_PARTICLES, LLPointer< Type >::notNull(), and NULL. 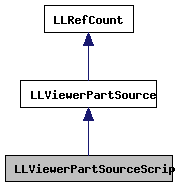 Definition at line 106 of file llviewerpartsource.cpp. References angle, f, F_PI, FALSE, LLViewerObjectList::findObject(), gObjectList, gPipeline, gWorldPointer, LLPipeline::hasRenderDebugMask(), i, LLPointer< Type >::isNull(), ll_frand(), LLPartData::LL_PART_FOLLOW_SRC_MASK, LLPartSysData::LL_PART_SRC_PATTERN_ANGLE, LLPartSysData::LL_PART_SRC_PATTERN_ANGLE_CONE, LLPartSysData::LL_PART_SRC_PATTERN_DROP, LLPartSysData::LL_PART_SRC_PATTERN_EXPLODE, LLPartData::LL_PART_TARGET_LINEAR_MASK, LLPartSysData::LL_PART_USE_NEW_ANGLE, llmax(), llmin(), LLVector3::magVec(), LLVector3::magVecSquared(), LLPartSysData::mAngularVelocity, LLPartSysData::mBurstPartCount, LLPartSysData::mBurstRadius, LLPartSysData::mBurstRate, LLPartSysData::mBurstSpeedMax, LLPartSysData::mBurstSpeedMin, LLPartData::mEndColor, LLPartData::mEndScale, LLPartSysData::mFlags, LLPartData::mFlags, LLViewerPartSource::mImagep, LLPartSysData::mInnerAngle, LLViewerPartSource::mIsSuspended, LLViewerPartSource::mLastPartTime, LLViewerPartSource::mLastUpdateTime, LLPartData::mMaxAge, LLPartSysData::mMaxAge, LLPartSysData::mOuterAngle, LLPartSysData::mPartAccel, LLPartSysData::mPartData, mPartSysData, LLPartSysData::mPattern, LLViewerPartSource::mPosAgent, mRotation, LLViewerPartSource::mSourceObjectp, LLPartSysData::mStartAge, LLPartData::mStartColor, LLPartData::mStartScale, mTargetObjectp, LLViewerPartSource::mTargetPosAgent, LLPartSysData::mTargetUUID, LLMemType::MTYPE_PARTICLES, LLVector3::mV, LLVector3::normVec(), LLUUID::notNull(), LLPointer< Type >::notNull(), NULL, LLPipeline::RENDER_DEBUG_PARTICLES, LLVector3::rotVec(), S32, setDead(), LLQuaternion::setQuat(), setTargetObject(), TRUE, VX, VY, and VZ. Definition at line 123 of file llviewerpartsource.h. Definition at line 128 of file llviewerpartsource.h. Definition at line 129 of file llviewerpartsource.h. Referenced by setDead(), setTargetObject(), and update().